2500HP Ford GT Hits 300.4 MPH at the Texas Mile! New Standing Mile Record! - Muscle Cars Zone! This amazing 2500HP Ford GT hits 300.4 MPH on Sunday at the Texas Mile and sets a new standing mile record! This car has set records at the Texas Mile before. But none with a number ‘3’ in the front. Can you imagine that at that speed, it takes the Ford GT less than 1 second to cover the length of a football field. This car is actually previous model of Ford GT built by M2K Motorsports. The 1 mile long runway is at the Victoria Regional Airport. This amazing track was enough for this stunning Ford GT to establish a new standing 1 mile record on its 3rd run. The guys from M2K Motorsports have announced that finally they went over 300 MPH in the standing mile. They say it takes so many people to make this happen and they thank everyone for the encouragement and all the support over the last several years. 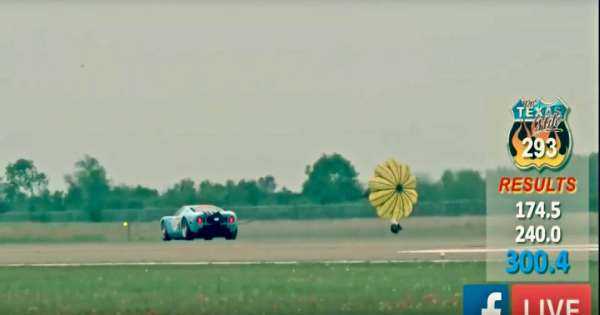 As you can see on the uploaded YouTube video by M2K Motorsports, the Ford GT warmed up with its first run hitting “just” 174.5 mph, on the second run they reached 240 mph and on their 3rd and final run they reached 300.4 mph. For the europaen folks, that’s an incredible 483.44 km/h in 1.60 kilometers of asphalt road. Under the hood os this Ford GT there is a 5.4 liters V8 with an estimate of 2,500HP because it’s a bit difficult for the cars with this much power to run them on the dyno. Now only time will tell if the guys from Koenigsegg or Bugatti will answer on this record.